National Cycle UTV Windshields come in both a Low Size and a Full Size, and all feature our exclusive Quantum® hardcoated polycarbonate for the toughest, most scratch resistant windshield you can own. No matter what terrain or weather you encounter, our UTV Windshields will keep you rolling, mile after mile, year after year. 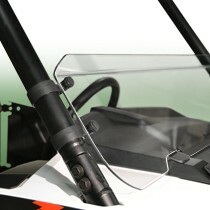 3D This UTV Windshield features 3D-formed curvature rather than the traditional flat style. The benefits of a 3D-formed windshield are striking good looks, a beautiful cockpit view, and substantial added rigidity, which is particularly noticeable in full-size windshields. Our 4.0mm thick Lexan® polycarbonate will take anything you can throw at it, or anything the road can throw at you. National Cycle's exclusive Quantum® hardcoating has been UV tested in our own lab and provide a minimum 10-year lifespan and scratch resistance 10x greater than standard FMR polycarbonate. These windshields will show you what tough is all about! All National Cycle UTV Windshields are made from thick, durable polycarbonate with National Cycle's exclusive Quantum® hardcoating. These are the best quality windshields you can get, with excellent optical clarity, unbeatable strength and unsurpassed scratch resistance. Only National Cycle has the manufacturing expertise to produce UTV windshields that will hold up to the roughest terrain. You won't find a better UTV windshield than this! 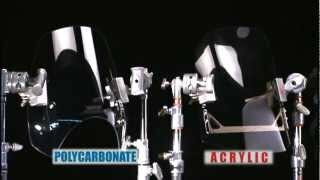 Our UTV Windshields are packaged with complete mounting hardware, including our custom-designed Wraparound Clamps for UTV roll cages. Installation is fast and simple — you'll be back to work in no time (sorry about that). Treat your new UTV Windshield to an application of our RainZip® rain repellent. It makes water bead up and roll right off. RainZip is specially formulated for powersports applications, including polycarbonate and acrylic windshields, face shields and goggles.